Dr. Thedinger is a native of Kansas City. He earned his Bachelor of Science degree in molecular biology from Vanderbilt University and his medical degree from the University of Kansas. He completed a residency in Otolaryngology at Harvard University-The Massachusetts Eye and Ear Infirmary. Dr. Thedinger completed a fellowship in Otology/Neurotology from The Otology Group/The Ear Foundation in Nashville, Tennessee. Dr. Thedinger is board certified by the American Board of Otolaryngology. He is a member and past president of the Metro Omaha Medical Society. He is currently on the board and is vice speaker of the Nebraska Medical Association. He is also a member of the American Neurotologic Society, the Otosclerosis Study Group, the Academy of Otolaryngology-Head and Neck Surgery, and the American Medical Association. Dr. Thedinger and his wife, Kelly, have three children. They have lived in Omaha since 1990. 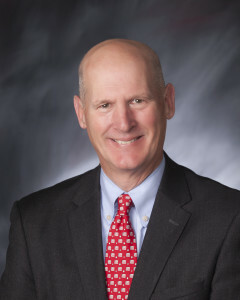 He currently serves of the Boards of The Nebraska Medical Society, Metro Omaha Medical Society, Omaha Chamber of Commerce, Catholic Charities, Duchesne Academy, Jesuit Partnership, and the Omaha Hearing School.